1. A designator that indicates the nature of a relationship between entities represented by authorized access points, descriptions, and/or identifiers. 2. A device (i.e., a label, phrase, or term) that indicates the kind or type of relationship that exists between one entity and another (e.g., between two works, between a person and a work). 3. 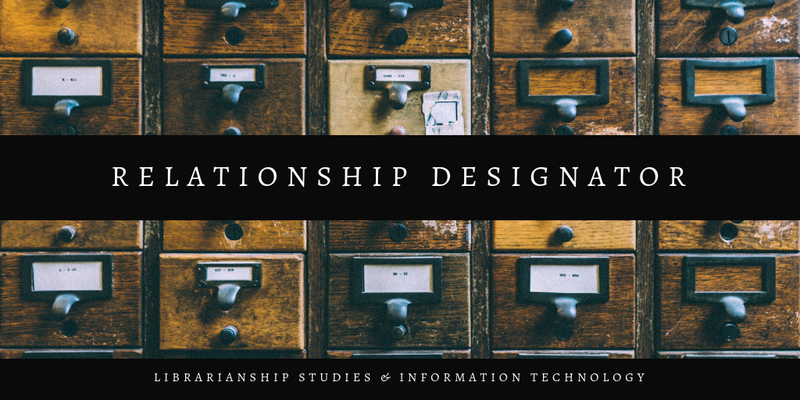 Relationship designators, also called relator terms, are words or short phrases that describe the relationships between entities associated with library collections. Relationship Designators are used in bibliographic records as well as authority records. Note: This article is presently under development. 100 1# $a Haider, Salman, $e author. Daniel N. Joudrey; Arlene G. Taylor; David P. Miller, Introduction to Cataloging and Classification, 11th Ed. (Santa Barbara, California: Libraries Unlimited, 2015).